The following Internet sites are provided to give you more information resources regarding sleep and sleep disorders. The act of placing a site on the list does not indicate any manner of endorsement from the webmaster for information presented in the site or for any products sold from the site. Likewise, the inclusion of a site below does not indicate an endorsement for this site or the book from that organization. This list does not even begin to list all of the sites available, but will provide a good starting place. try sleep, sleep disorders, insomnia, the specific disorder you want, etc. Although some of the sites below were mentioned in the body of the book, most are new including topics that were not discussed in the book such as narcolepsy, dreams, and children's sleeping problems. If a description has quotation marks, the information was picked up directly from the site or a spokesperson for the site. Click Here to Submit a Site for Inclusion on this page. However, we reserve the right to reject any site we deem inappropriate. Has several excellent forums on different sleep disorders for the public and for professionals. Many of the posts in this book came from these forums. "Sleep disorder community providing authoritative sleep information and live sleep disorder support: news, chat rooms, message boards, and articles." Online Psych-AOL, go to KEYWORD, enter Online Psych, hit message boards, then dreams or sleep disorders (the message board at the time of this publication was very strong for narcolepsy, but not for other sleep disorders). Food Addictions-AOL, go to KEYWORD, enter a&r (addiction and recovery), hit message boards, then food addictions- this will put you with the message board for Kay Sheppard, Overeaters Anonymous, and others. Deja News is a free service that allows the user to search the archives of more than 50,000 discussion forums, including Usenet newsgroups such as alt.support.sleep-disorder listed below. And while the newsgroups only carry old listings until the space allocated is used, Deja News still provides access to the older information. Use Deja News like a search engine to find all of the posts on a given topic such as sleep, sleep disorders, sleep apnea, etc. The most active sleep disorder site of which I am aware. Many of the posts in this book came from this site. alt.drugs.caffeine - I don't particularly care for the newsgroup, but the "Frequently Asked Questions" has a good deal of information. alt.support.narcolepsy - Narcolepsy support group. Thrive-AOL, go to keyword, thrive@health, chats, sleep disorders support groups, go to health chat room. Monday 9pm-11pm EST: go to health chat room, hit private chat, type in "sleepers lounge"
Wednesday 9pm-11pm EST: go to health chat room, private chat, type in "sleepers lounge". disorders with links to other sleep disorder sites. "SleepNet was started to help get the word about sleep disorders and sleep deprivation to the public. One of the goals of SleepNet is to link all the sleep information located on the Internet." "Your online magazine for Insomnia News, Research and Support." Information about sleep disorders as well as about research and education. Presented by the National Heart, Lung, and Blood Institute (NHLBI), a part of the Federal Government's National Institutes of Health. Excellent information. Also listed under Sleep Organizations. Includes a sleep test (listed in the sleep disorder test classification) and information on sleep disorders as well as information on sleep stages and REM sleep. 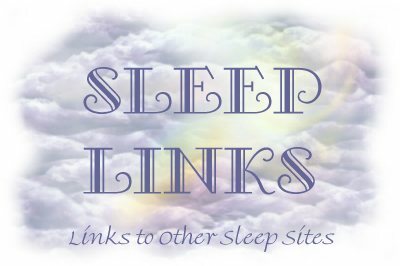 This site features an extensive listing of sleep related links to other sites. "This home page lists resources regarding all aspects of sleep including, the physiology of sleep, clinical sleep medicine, sleep research, federal and state information, patient information, and business-related groups." A comprehensive site listing many sleep disorders with its own support forum and chat room. "Sleep/Wake Disorders Canada is a national, self-help registered charity dedicated to helping the thousands of Canadians suffering from sleep/wake disorders. SWDC have chapters across the country which provide a face to face forum for meeting others with sleep disorders and also provide much needed information and support. It's members work to improve the quality of life, alertness, and productivity of persons with sleep/wake disorders. SWDC has information brochures, articles, booklets and videos for educational purposes and publishes a quarterly newsletter Good/Night Good/Day. As well, they run an annual conference and hold group meetings. They are an invaluable resource for both physicians and the public. 3080 Yonge Street, Suite 5055, Toronto, Ontario M4N 3N1. Telephone: (416) 483-9654 and 1-800-387-9253 for calls outside of Toronto. FAX: (416) 483-7081"
A site by Aidan Morley which includes a discussion forum, links, sleep tests, and sleep-related products. This site has it all... from links to other sites, information on sleep disorders, how to become a sleep activist, recommended books and publications, self-tests, dreams, and children's sleep disorders to sleep humor and much more. "Serta's primary product, the Perfect Sleeper�, is the best-selling premium mattress brand at retail in the U.S. today. Serta is also the nation's number one mattress supplier to hotels and motels." "AIM stands for American Innerspring Manufacturers, a non profit association that provides information on healthful sleep and sleep surfaces. Through their support of numerous scientific studies and national surveys, AIM has educated a generation of American Consumers on how to get a good night's rest, as well as what to know and look for when it comes to choosing bedding." Includes tips for a good night's sleep as well as information about mattresses. "Established in 1978, the Better Sleep Council (BSC) is a nonprofit organization supported by the mattress industry. The BSC is devoted to educating the public about the importance of sleep to good health and quality of life and about the value of the sleep system and sleep environment in pursuit of a good night's sleep." Information pertaining to their sleep system, as well as information on stress reduction. Information on their sleep system. Site includes information on their sleep system as well as sleep links. Everything you ever wanted to know about caffeine including where you find it and how it affects your health. Address may change as likely merging with the National Kidney Foundation this year. "The National Enuresis Society (NES) is a not-for-profit organization of doctors, medical personnel, and other persons dedicated to building greater awareness and understanding of enuresis. By creating this awareness and understanding, the NES hopes to help improve both the treatment of enuresis and the quality of life for children with enuresis and their families." "This site is the growing collaborative effort of individuals from across the United States and around the world. This sites offers up-to-date information as well as support for those who have been touched by the tragedy of SIDS/OID." Excellent information on infant and childhood sleep disorders. This site was written by Sandy Shaw who has suffered from CFS for years. "Delayed sleep phase syndrome (DSPS) is a fairly common disorder of sleep timing. People with DSPS tend to fall asleep at very late times, and also have difficulty waking up in time for normal work, school, or social needs... This document was written and distributed to provide information for the general public about aspects of sleep and sleep disorders. It is not medical advice, and individuals with a suspected or diagnosed sleep disorder should consult with a physician for advice regarding their own treatment." Presented by Su-Laine Yeo who suffers from DSPS. A non-profit organization promoting dream research. This site assists you in determining the underlying cause of your daytime sleepiness. "Dr. Ted Zeff teaches classes on healing insomnia at Kasier Permanente and Hill Physicians Medical Group. Dr. Zeff offers a home study guide and phone consultations; tips and resources for improving sleep." Presented by the Sealy Corporation, the largest mattress manufacturer in North America. Presented by Group Health Cooperative-the nations largest member-governed healthcare organization: Information on insomnia including suggested ways to improve sleep. "Recognizing the huge numbers of people who suffer from sleep problems, this site has help for insomnia, curious insomnia cures, and sleep information resource links." Sponsored by G. D. Searle and Co.-a good reference site that takes into account your individual problem and suggestions for overcoming it. "Guided Massage for Everyone, a 72-minute audio CD contains simple, step-by-step instructions which will enable anyone to give a relaxing massage to their partner, family and friends. Written and produced by Susan Lembo, Nationally Certified Massage Therapist, Massage Instructor and host of the radio show, Healthy Lifestyles." An article that is actually not as one-sided as the title indicates it might be. Another article with a little more balance. "My name is Simon Williams and I am a creative musician and multimedia artist from the UK. I recently finished an album "Gentle Rainstorm" which has received great praise from those who have had the opportunity to enjoy listening to it. The album has been described as a revelation in its calming qualities. I would like if it is not to much trouble to invite anyone to take a preview at a few short samples from the CD at my website"
A fun and interesting site by a support group for nap taking. "Narcolepsy Network is a national, non-profit organization incorporated in 1986. Our members are people who have narcolepsy (or related sleep disorders), their families and friends, and professionals involved in treatment, research, and public education regarding narcolepsy." Comprehensive site by a sufferer. Includes a message board. No fad diets here, just good nutrition with well balanced meals. "The Restless Legs Syndrome Foundation is a nonprofit 501(c)(3) agency that provides information about RLS; helps develop support groups; supports research to find better treatments and, eventually, a definitive cure; educates physicians and patients about RLS; and publishes a quarterly newsletter known as NightWalkers." Welcome To My RLS (Restless Legs Syndrome) Information and Links Page!!! A site featuring information and support for RLS victims by Jodi Judson who has suffered from RLS for over twenty years. "This site deals exclusively with SAD (Seasonal Affective Disorder) and seasonal light. It covers book listings, articles, and information on membership organizations and light-box and other seasonal light device manufacturers. From here are links to most of the seasonal sites." http://www.nyx.net/~lpuls/sadhome.html -a text only version of the above site. "Circadian Technologies, Inc. (CTI) provides research, consulting, training and information services. Since 1983, CTI has developed and applied proven, state-of-the-art methods and techniques for improving alertness, safety and job performance in continuous operations." "The American Sleep Apnea Association was founded in 1990 as a non-profit 501(c)(3) organization by persons with apnea and concerned health care providers and researchers. The ASAA's mission is simple: The American Sleep Apnea Association is dedicated to reducing injury, disability, and death from sleep apnea and to enhancing the well-being of those affected by this common disorder. The ASAA promotes education and awareness, the ASAA A.W.A.K.E. Network of voluntary mutual support groups, research, and continuous improvement of care." "A.W.A.K.E. in Philly is a mutual-help support group for people coping with a variety of sleep-related disorders, although the primary focus is on apnea. Providing a forum for education and support for people, family members and others interested in the sleep-disorder community is the main goal." "PURPOSE: To share with fellow sleep apnea sufferers what I learn in reading literature on sleep research, and to learn as much as possible from fellow patients." This site is often referenced by those who suffer from sleep apnea. It includes a self-scoring quiz, information on the book, "Phantom of the Night", and an excellent FAQ listed below. "Resources and information about sleep and sleep disorders including snoring and sleep apnea for the public, patients, and professionals." Frequently asked questions regarding sleep apnea and snoring. "Welcome to Quietsleep - the Web's most complete and reliable source of information on oral appliance therapy for snoring and obstructive sleep apnea." A brochure from the American Academy of Otolaryngology- Head and Neck Surgery. "Information about Sleep Apnea from a patient's viewpoint. The Apnea Patient's News, Education & Awareness Network is dedicated to increasing awareness of sleep apnea in the general public." "Information about snoring and surgical treatments with an online self-assessment of your snoring and a lively discussion forum." Four authorities give their opinions relating to the timetable for a cure for snoring, the introduction of a non addictive sleeping pill, the elimination of the need for sleep, and dream inducers. Tips by Tamara Eberlein on overcoming sleep deprivation. In praise of sleep- the best medicine. By Jon G. Allen, PhD-explains what happens when you sleep. Quanta Dynamics, Inc. is a provider of innovative programs to help people reduce stress, renew energy and increase productivity." Quanta offers the Gift of Sleep CD set and holds seminars on stress reduction, shift work, and insomnia. Presented by the Sleep Disorder Centers of America. Presented by Northside Hospital Sleep Medicine Institute in GA.
"The American Sleep Disorders Association (ASDA) is a professional medical association representing practitioners of sleep medicine and sleep research. Sleep disorders medicine is a clinical specialty concerned with diagnosis and treatment of patients with disorders of sleep and daytime alertness." "The American Psychological Association (APA), in Washington, DC, is the largest scientific and professional organization representing psychology in the United States and is the world's largest association of psychologists. APA's membership includes more than 155,000 researchers, educators, clinicians, consultants, and students. Through its divisions in 50 subfields of psychology and affiliations with 59 state, territorial, and Canadian provincial associations, APA works to advance psychology as a science, as a profession, and as a means of promoting human welfare." "The CSS is dedicated to the advancement of the continuing education of its members and improved standards of care for Sleep Centers in North and South Carolina." "The National Sleep Foundation is a nonprofit organization that promotes public understanding of sleep and sleep disorders and supports sleep-related education, research and advocacy to improve public health and safety. Established in 1990, the Foundation relies on corporate and individual donations, and partnerships with corporations and government, to fund its many educational and research programs." "The Brain Information Service (BIS) at UCLA provides a 'storefront' for Home Pages for any sleep organization, entity or activity that promotes the research or treatment of sleep and sleep-related disorders." "A Web page for displaying information about the Southern Sleep Society. This site provides information about the annual meeting." Includes a listing of Austrian sleep clinics. "The Canadian Sleep Society / Soci�t� Canadienne du Sommeil (CSS / SCS) is a professional association of clinicians, scientists and technologists formed in June 1986 to advance education and research in sleep and its disorders in Canada." An organization for sleep research professionals in The Netherlands. "The European Sleep Research Society is an international scientific non-profit organization and promotes all aspects of sleep research. These include the publication of the Journal of Sleep Research (JSR), the organization of scientific meetings, and the promotion of training and education, the dissemination of information, and the establishment of fellowships and awards." "These pages provide information about THE FINNISH SLEEP RESEARCH ASSOCIATION and its least sleepy members. The purpose of this forum is to provide the members of the society as well as others up-to-date information about what is on for tonight in sleep research in Finland. You are likely to find out that many of us suffer from severe sleep deprivation." This site includes a listing of German sleep disorder clinics. "The Sleep Research Society exists to promote understanding of the processes of sleep and its disorders through research, the training of practitioners of research and the dissemination of the fruits of their efforts to the scientific and medical communities as well as the general public." "The Society for Light Treatment and Biological Rhythms is a not-for-profit international organization founded in 1988, dedicated to fostering research, professional development and clinical applications in the fields of light therapy and biological rhythms." "The main intention of the WiSRR group is to provide communication and mentorship between women scientists and students studying any aspects of sleep from basic science to clinical issues as they apply to both men and women." Listing of accredited sleep disorder centers by state. �1998 John Wiedman and Advantage Web. All rights reserved.